Canon has announced the new EOS 100D, also known as the Rebel SL1 in North America, which is the world’s smallest and lightest DSLR camera yet. The 100D is based on the recently launched EOS M compact mirrorless camera and borrows many of the specifications from it. For starters, it uses the same 18 megapixel CMOS APS-C sensor capable of shooting from ISO100-12800 (expandable to ISO25600) and up to ISO6400 for video (expandable up to ISO12800). It uses Canon’s DIGIC 5 processors that lets it shoot up to 4 fps in burst mode. There is also a nine-point auto-focus system with a new Hybrid CMOS AF-II sensor. The 100D is capable of recording videos in up to 1080p resolution at 30 fps with continuous auto-focus. On the back, the 100D has a 3.0-inch, 1040k dot touchscreen LCD. The EOS 100D/Rebel SL1 will go on sale in April and will be priced at £799/$799 with the EF-S 18-55mm f/3.5-5.6 IS STM kit lens. In other news, Canon has also launched the new EOS 700D/Rebel T5i, which replaces the older 650D/T4i. 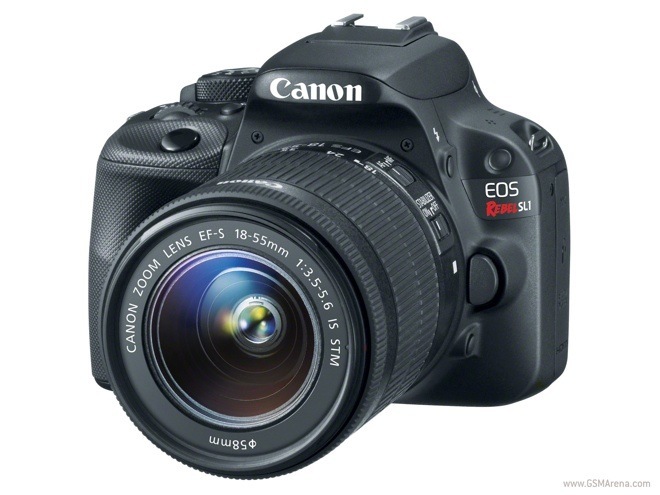 It’s mostly similar but comes with a new 18-55mm STM lens instead and is priced £849/$899.